My name is Sandy Yost, CSJ. I’ve been a Sister of St. Joseph (Baden, Pennsylvania) since 1984, and I’m currently an Associate Professor of Electrical Engineering at the University of Detroit Mercy. It’s true that this is an unusual combination, and some folks find the concept of a Roman Catholic sister who’s an engineer downright fascinating. When it comes right down to it, however, I’m just another seeker trying to live a meaningful life in right relationship with God, myself, and others. I have some passions for which I try to make time. One is music – I play clarinet, alto sax, and sometimes djembe at Gesu parish in Detroit. 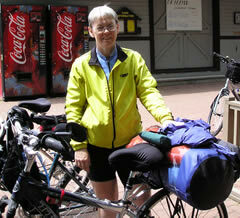 I also love a variety of outdoor activites, like bicycling, hiking, cross-country skiing, camping, etc. The Techie Nun tagline reveals another passion, which is good considering what I do for about 50 hours a week. I love technology, especially technology that facilitates bringing people together. Thus, this blog. I hope you’ll get to know me a little better as I try to give you a glimpse into religious life and how that fits with the rest of my life. And I hope you will join the conversation by leaving comments! If any of you want to bore yourselves with my detailed CV, here’s a link to it. Sandy, this is so cool!!!!!! What a great way to connect with others and offer that connection. I’ll try and post something more thoughtful in the next couple of days. I look forward to hearing more from you. Great to meet you last weekend…. I like your blog…thanks for sharing your thoughts, experiences and passions. I appreciate reading them…:)! Ah, okay. Electrical Engineer. Associate Professor. You can disregard my previous question. I am in need of some electrical engineering education … hoping to find answers on the web. Would it be taking advantage if I seek your electrical engineering knowledge? Your question intrigues me….you can always ask…if I know or can point you in the right direction, I’ll be glad to help! Ok.. so I don’t even know where to start but I have to start by saying that I want to become a Nun. I have several obstacles to face of course. I am not catholic, I have children, and I’m divorced. But I know God wants this for me. I know he does. Once I said ok God is this really what you want then I had a sense of peace come over me that I can’t explain. I need your help and guidance and is it even possible. Can I overcome those challenges to become a Nun? First, it most definitely is possible for you to pursue your calling. If you want to enter a Roman Catholic congregation, you would have to become Catholic. How long after you join the RC church will you have to wait before entering a congregation? I’m afraid I don’t know the answer to that, as I’ve never done vocation/formation ministry. I know many divorced women who have become nuns, so that is not a huge obstacle. As for your children, again, I am not an authority on this, but it seems to me that most congregations would want a woman to wait until her children are grown up and on their own before she enters. The experience you had of a sense of peace coming over you could indeed be a sign that God is calling you to this life. Perhaps the best thing you can do for yourself at this point is to find what is called a spiritual director. Having a regular spiritual director can help you to futher discern what God may be calling you to. In any case, entering a religious congregation takes a mutual discernment between the congregation and the candidate, so it’s not something you can decide unilaterally, no matter how strongly you feel God may be inviting you. If there are any vocation/formation folks reading this, would you please help us out with the parts I don’t know about? Thanks! Thank you so much for the information. I sure have met a lot of opposition to this so far from family and friends. I only tell them they just don’t understand and to please be patient with me as I find my way. I assumed I would have to wait until the children grew up but I plan on converting them to the Catholic religion as well. I will take your advice and find a spiritual director. Thank you again and I look forward to this journey with God. It was so nice to hear that I don’t have to be perfect or at least not yet. I have many obstacles but it is the truth that God will find a way for me. If he leads me to this path he will surely lead me through the obstacles. Most of my friends are supportive. I had lunch with my best friend and she believes that if this is God’s calling for me then it will be. I believe this too. I know I have to take everything I do one step at a time. My first step is to do one thing I have been meaning to do but have just never gotten around to until now. I want to read the bible. The entire Bible front to back. Not just the verses that my preacher preaches on each Sunday. I am also going to a Catholic church this Sunday and look for more answers to the questions in my head and heart. It’s hard to realize that it’s not about what I want, it’s about what God wants me to do with this life he has given me. I know above all he wants me to have a more personal and close relationship with him and if nothing else comes of my life then, I know I can give him this. Thank you. I NEVER read blogs. In fact, yours is probably the first I ever read. I find your life and story fascinating. I think your work in a secular field is a great witness for the Lord and for the Church. Sister, I think I was just “googling” around late at night under things like “prayer” and “nuns”…that’s how I found your blog. Fun stuff. I came across your blog googling for “LaTeX”. It seems like google is one of those wonderful technologies that bring people together. I just happen to stumble over your blog. After reading it for a few minutes, I decided to check out the “about me” section. I live in Detroit as well (Berkley to be exact) at the Jesuit novitiate. I believe that I have also seen you playing music at Gesu which we frequent almost every weekend. What a small world! Keep on blogging. I really enjoy it. Yeah, I guess I don’t get over to see you guys much anymore since I no longer live with Theresa (or any of the other RSM’s for that matter). I now live quite close to you guys (in Oak Park), and I often ride my bike through your neighborhood (mostly up Mortenson on my way to places north and west). Give me a holler if you want to invite me over for any shindigs this summer…I’ve put a “contact me” form on this page so you can reach me without having to broadcast to the world. I just wanted to say thank you for being an inspiration and also for taking the time to not only blog but also respond to your blog subscribers! Peace be with you my friend. Gee, whiz…well, thanks, Ruth. Thanks for your encouragement, and please, pray that God will continue to give me words to share that are helpful to folks… Peace to you, also! I have known CSJ sisters all of my life. I grew up around them. (In St. Paul MN) I have nothing but respect and admiration for all that you do. The world would be missing a very bright light without you. Just your prayer to continue to be helpful is helpful!! = } See what I mean?